Presented by Jeff Blincow who will be talking about Bhutan. We will enjoy the dramatic scenery, superb wildlife and unique culture of this ‘Land of the Thunder Dragon’. 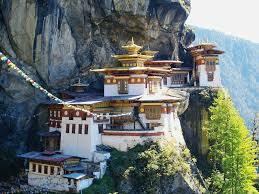 Visiting this small Himalayan country gives you a true flavour of the wildlife of the Himalayas. 70% of the forests still survive in this mountain kingdom giving many opportunities to see species that are difficult to find elsewhere. Our photograph shows the ‘Tiger’s Nest’ monastery, aptly named since tigers still roam the forests of Bhutan and even the mythical yeti has been granted its own national park. 770 species of bird have been recorded.